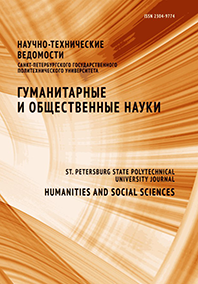 Olga D. Shipunova Berezovskaya Irina P. Gashkova Elena M.
The article examines topical issues of individual self-identification in the dynamic information exchange in modern digital environments. The purpose of the article is to analyze cyber-anthropology ideas with respect to the informational nature of personality and the interpretation of the self-identification process relying on the structural principles of a multi-agent system. The specifics of the modern conditions of personality formation is analyzed by means of system methodology and the cognitive paradigm. It is emphasized that the growing information environment and virtual community form specific cognitive commitment to fractal narrative as the primary way of creating narratives, concepts, and cognitive practices among the members of the digital generation. The unity of consciousness, which holds the personality as a whole, is called into question. In the context of cyber-anthropology, the conditions of personality formation are replaced with digital cyberspace modules. The result of experimentation with personal identity in the virtual environment is that personal identity in the modern world continuously transforms and remains incomplete. The virtual agents, exercising their identity many times in the digital space, transform into a function of the information technology structure, lose their individuality. The process of self-identification comes full circle in virtuality.